The genesis of this holiday is unknown, as are the suggested observation methods. We are simply reminded us to share the stories that have been passed from generation to generation, warning us about villains, reminding us to stay in line, and allowing us to imagine a world where magic can help right wrongs. Below are just a few ideas to help K-8 teachers consider how to share and celebrate great folklore with your students, regardless of age. But first... What is a fairy tale? How is that different than a folktale, or a tall tale? Review the definitions in the below Quizlet to gain a better understanding. Where to find fairy tales? Libraries using the Dewey system will have them at 398.2, although some may also be found in the picturebook or fiction sections. This becomes especially tricky when looking for adaptions. 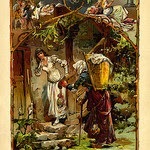 The Grimm Brothers' Children's and Household Tales: Index to full text tales, includes source notes. SurLaLune: Includes full text as well as notes on historical context. Folklore and Mythology Electronic Texts: Fantastic index to folklore. International in focus, wide reaching in content (includes aliens!). Links to full text where available. Debate the inclusion of tales or books in the genre of folklore, consider the more specific type, using the definitions provided above or your own. Introduce the concept of mail merge by generating Fairy Tale mad libs. Create a Fakebook for fairy tale characters. Who would be friends? What would they post? If fairy tale characters were YouTubers or Viners, what would their pages and videos look like? Create videos to share in class or create real YouTube or Vine accounts to publicly share videos. iFakeText conversations: Consider the conversations that readers do not see in the tales. What would the wicked stepmother and her daughters discuss via chat? What would the Princess from the Frog Prince say to her friends about her new friend? Using a classroom friendly format (paper, mixed media, digital), visually represent a poignant scene from a tale, create a book cover, or design a movie poster. Take the text of a tale, determine the layout, add your own illustrations. Create "Wanted" posters for a story's villains. Using a well known or popular song as the base, write a parody that describes a character, relationship, or entire tale. Read an "original" version of a tale, compare the details of that story to those found in modern picturebooks for children. Practice note taking and paraphrasing using a favorite tale. Turn a fairy tale into a poem. Increase the challenge by focusing on a specific type, such as limerick or haiku. Compare/contrast various retellings of a tale. Consider: Zelinksy's Rumpelstiltskin, Duffy and the Devil, The Girl who Spun Gold, and A Curse Dark as Gold. Invite students to write their own fractured fairy tale. Using mindmapping software or tools to identify common elements of fairy tales, analyze a character, or identify themes. What is the significance of the villain, the victim, the hero, and the bystanders in the originating culture? What purpose did the story serve? Compare and contrast similar stories from different cultures, such as these "Cinderella" tales: The Little Glass Slipper (France), YeShen (China), Mufaro's Beautiful Daughters (Zimbabwe). Write your own modern fairy tale, taking into consideration the social norms and mores of your local culture.